With LICHTMOND 3 "Days of Eternity" gold and platinum winning sound architects Giorgio and Martin Koppehele continue their artistic journey by setting another audiovisual milestone. 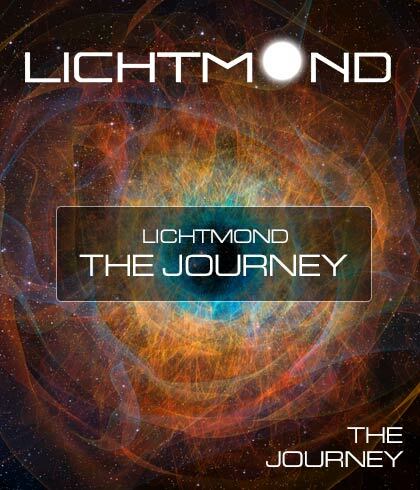 Perfect sound and a fabulous, song-based story merge in the LICHTMOND 3 experience that takes you on a fantastic journey to the pristine world of the planet "Chronos" - the universal giver of time - where time disappears, time goes and time is born. Sometimes hypnotic, sometimes spherical, sounds float over massive rock guitars or slow-motion beats. A magic triangle of electronics, ethno and rock songs, big voices and poignant poetry shape the pure originality of LICHTMOND. While audio-magic fascinates anew, perfectly composed visual worlds put the viewer under their spell more than ever. LICHTMOND with its spectacle of fantastic images presents a complete story combined with a perfect dramatic arc. In addition to the intoxicating sound mixtures in 5.1 and 7.1 surround sound, for the first time the audio pioneers from Germany offer LICHTMOND in a special Auro-3D 9.1 sound mix. The Pure Audio Blu-ray is surprising in that it delivers the various sound formats from LICHTMOND and the playback options of the Pure Audio Blu-ray. For sound lovers a highlight that leaves no wish unfulfilled. The fantastic animations were created by Spanish visual artists Diego M. Bonati and Javier Sáenz-Messia of IMAGO-D Studios. Their 3D animation technics offers an immersive stereoscopic 3D experience, more color intensity, has a higher resolution, is more expressive and brilliant. And, is already equipped for all requirements of the new 4K UHD technology. LICHTMOND has its own radio show: „Klassik Lounge with LICHTMOND“ on Germany’s biggest privat radio station KLASSIK RADIO. Every month a new two-hour LICHTMOND radio show will be broadcasted on Klassik Radio. Welcome to LICHTMOND 3 "Days of Eternity"! The first two LICHTMOND productions "Moonlight" and "Universe of Light" (in Blu-ray format) were especially popular with home theater viewers. Now is the time to showcase the creative writing talents of Giorgio and Martin Koppehele and their wives Gabi and Suna. LICHTMOND is totally unique in the pop music of the 21st century. Its incredible imagery is the icing on the cake. "We see our music as a magic triangle of electronics, the rock of the 70s and 80s and ethno music," says Martin Koppehele. This special blend makes LICHTMOND so outstanding. Martin: "The music of Pink Floyd, Tangerine Dream and Alan Parsons strongly influenced us in our youth. Based on this inspiration, we developed our own style. This mixture is the source of our originality." Giorgio adds: "Another thing that shapes us is our distinct aesthetic approach. The sounds are just as important as the compositions." This is quickly evident when listening to "Days of Eternity." The mostly epic tracks are kaleidoscopic, a thousand facets of light. Sometimes quiet, sometimes hyper tempos enchant the listener within a delightful daydream that one never wants to leave. Supported by prominent guest artists such as Midge Ure, I Muvrini, Sky du Mont and Hardy Krueger Jr., LICHTMOND succeeds as an exotic, other-earthly, sound painting that oscillates like yin and yang between the poles. Giorgio: "The fact that the core members are - two men and two women - plays an important role and is probably one reason for our success. The melodies, which often make up the soul of the music, as well as the lyrics and poems, usually come from our wives. This is a very special blend. Martin's wife Gabi writes the poems and the German lyrics, my wife Suna, writes the melodies and the English lyrics. Sounds, beats, loops, electronics and the LICHTMOND "sound-architecture" are the "masculine" part of our albums." Again the artists Meera Fé (vocals, piano), Thomas E. Killinger (poems, piano), Saskia Philipps (vocals) and Karen Kassulat (vocals) are an important part of LICHTMOND 3. "Days of Eternity" is an acoustic metamorphosis of changing atmospheres. Reminiscent of the best of Pink Floyd's semi-acoustic ballads LICHTMOND's "Wheel of Time" follows "Catching Rainbows" with a trance-electro-beat. "Empires of the Past" is driven by tribal beats through a thunderstorm to a veritable rock format, beautifully supported by a stunning poem spoken by Sky du Mont. The title song, "Days of Eternity" soars with the exotic voices of the Corsican vocalists I Muvrini to a global, almost galactic anthem. "Endless Moments" jointly composed with Midge Ure and sung by the Ultravox front man is adult pop in arena format. All of the songs are different, each touching in its own way, enigmatic, stimulating, and imaginative. LICHTMOND will soon present their music live on stage. How will it look? Martin: "In addition to a classic stage show there are already multiple ideas on how to implement our sound and imagery. We intend to make every concert an unforgettable event."